Contemporary Ukulele Program™ Level V will cover highly-anticipated melodic fills and intros on the ukulele. Featuring fun and simple riffs, take your playing joy to an even higher level by playing melodic lines over existing and new rhythms. The addition of embellishments will enhance your playing and bring a sparkle to your songs. 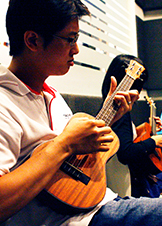 Go beyond the ordinary and begin to experience all the ukulele can offer! Theme: THE STORY OF MANKIND: Inventions highlights the great achievements of the Renaissance era. Be inspired to achieve greater things for yourself and humanity. iii) Have at least 2 years of guitar playing experience with riffs and licks.